1. Ground flaxseed – We started adding ground flaxseed to our diets back when Ryan was struggling with speech delays. After much research, I learned that ground flaxseed is full of Omega 3s, which are great for brain (and speech) development. Whole flaxseed is less expensive than pre-ground flaxseed and can be ground in a coffee grinder. It does go rancid quickly, so I don’t grind more than 2 Tablespoons at a time. It can be stored in the freezer to keep it from going rancid too fast. I store mine in the freezer for up to 4 or 5 months. I add ground flaxseed to smoothies, applesauce, (dairy-free) yogurt, and baked goods. I usually add about 2 Tbsp to muffins or cookies without it dramatically affecting the outcome of the recipe. Simple, inexpensive way to get more Omega 3s. 2. Real fruit smoothies – Make a fruit smoothie with real fruit and a natural sweetener like honey or agave nectar for breakfast or lunch…or an afternoon snack. 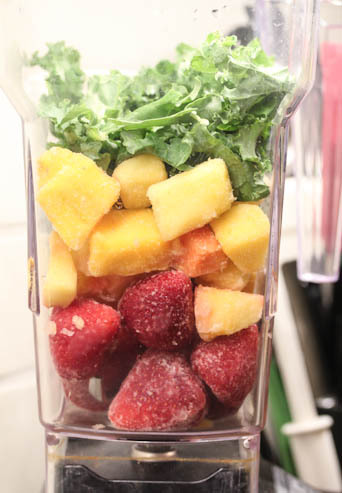 And don’t be afraid to add greens to your smoothies. And don’t forget the ground flaxseed. 3. Salads with Homemade Dressing – Add more greens to your diet by committing to eat at least one salad a day, whether a large salad for lunch or a side salad with dinner. Buying the whole lettuce head is significantly cheaper than the pre-packaged lettuce. Try this ratio method for homemade vinaigrettes or mix up your own homemade ranch dressing mix. 4. Nuts and dried fruits – Keep a stash of dried fruits and nuts in your pantry…they are perfect for afternoon cravings, have a long shelf life, and can be stored in the freezer as well. And when you seem to be running low on each, mix them up into a pantry trail mix. 5. Beans, beans, beans. Inexpensive, and packed with fiber. And a complete protein when combined with other ingredients like brown rice and potatoes. Learn how to cook beans from scratch and spend even less when buying them! Have you made any recent changes to improve your diet and eat more healthy foods?! Thanks for sharing the tips! They are GREAT! Also, did you know in some baked goods, flax can replace eggs? Thank you for the tip on Flaxseed. I have seen it in most of your recipes and always hve left it out. No I think I should grab some at Wegmans and start using it. Where can I buy the ground flax seed? April, most grocery stores carry it now. I’ve seen the ground flaxseed from Bob’s Red Mill or Hodgson Mills. Bob’s is in a bag & Hodgson is in a box. They are normally 12oz-1lb so not very big. Make sure to get the ground, not whole (unless you have a grinder you can use) because your body has a hard time digesting the whole seed. Krogers has it in the Nature Path section, Walmart in in the cereal or baking aisle (One Walmart by me has it’s on organic section by the cereal) & Meijer has it in the baking aisle. All great points, and really very do-able! Well, my BIL died this afternooon of a heart attack at age 36. He was a very heavy, unhealthy man but a good man. This is a timely post for me as while I have made more healthy choices for my family I can do much, much more.